A lot of ink has already been spent on this subject since many astronomy enthusiasts are wondering what the actual gain is observing with both eyes instead of only one. Let me begin by saying that this whole discussion is fairly pointless because observing with both eyes is a completely different experience than observing with only one. The feeling of total immersion that not even a 150° eyepiece can ever offer, the strange 3D-effect, the joy and relaxation of using both eyes… Personally, even if there were no light gathering gain at all I’d opt for a binoscope, regardless the expense. On the other hand there are people who’re having difficulties observing with both eyes. And finally there’s the big unknown factor: the human brain, which is both unpredictable and personal. So what’s the use of me writing this article? Because we astronomy enthusiasts have the unstoppable need to quantify everything. How much more can you see with a 14” telescope compared to a 10”? How does a refractor compare to a Newtonian (please, no, not again…)? Or… how much more can you see with both eyes? So here I go… explaining my 2 cents on this, for what they’re worth. Unfortunately very little real scientific study, if any at all, has been carried out to shed some light here. That is to say, a study that has been performed from an astronomical and not a medical point of view. Back in 1965, Campbell and Green published their renowned study in which they concluded that detection improves by a factor of 1.41 (√2) when using both eyes instead of only one. This figure has since also been adopted by part of the astronomical community. A factor of 1.41, or an actual detection gain of 41%, implies a telescope diameter gain of 19%. In other words, an 18" binoscope would be more or less equal to a 21" monocular telescope. Given that it is generally considered that you need at least a 30% increase in aperture (or 14% in diameter) to get any visible difference at the eyepiece, the real detection gain between an 18" mono or an 18" bino would be marginal and hence not worth the expense. The awe that one experiences when observing with a binoscope would therefore merely be an illusion, created by the larger perceived field of view and the beguiling 3D-effect. After having observed with a big binoscope for 2 years and a half and having done direct comparisons between mono and bino several times during every observing night (a binoscope is put in focus one eyepiece at a time), I daresay that all of this is pure nonsense. First of all, the Campbell and Green study was – again – a medical study, not an astronomical one, and it was intended for "normal" eye use. Citing it for binocular detection under astronomical conditions is therefore absurd, to say the least. Pirenne already concluded in 1949 that there is no such thing as a single binocular summation factor, but that binocular summation greatly increases with deteriorating conditions. The darker it gets, the better you see with both eyes. I’ve also read an article of someone who claims to have performed a limiting magnitude test with a pair of binoculars and found an actual detection gain of 0.2 magnitudes. This is , if you ask me, a very dubious statement because there is no clarification as regards to the method, nor the reference stars used. An 18” telescope has a theoretical magnitude limit of 17. A 25” (twice the aperture) has a limit of 17.7. Therefore, if you’re going to do such a test with an 18” binoscope, you need a field of view which contains stars of mag. 17, 17.1, 17.2 and so on. You also need a perfect sky with a perfect atmosphere. When sky conditions are less than perfect, or worse, average, the limiting magnitude difference diminishes somewhat due to a brighter background and hence reduced contrast. So what is the real difference between an 18” and a 25” under a certain sky? You’d have to put both telescopes next to each other in order to find out and point to a star field which contains the right reference stars with the right magnitudes. And even then, we all know how tricky limiting magnitude tests can be with the naked eye, let alone with a telescope, or two scopes with a different exit pupil. What I can already state with great certainty, is that when closing one eye many of the fainter stars simply disappear, or become very hard to see. I’ll also give an example in my observation of M76 (see below). What does real science tell us? When you read them more carefully, you come to the conclusion that there’s still a great deal of uncertainty about the extent of binocular summation. Still, these studies lead us to believe that the binocular summation factor in the total dark (greatly) exceeds the 1.41 factor under "normal" conditions. What does experience in the field tell us? Drop a binoscope at a star party and see where all the people are flocking. Seriously though. I've made a few direct comparisons between my 18" binoscope and big monoscopes. On the picture below you can see the 18" bino with in the background two high-quality 20" scopes, one of which was an f/5, coincidentally the same focal ratio as the bino. According to the 1.41 theory, these scopes should yield more or less similar performances. In reality, however, the 20" were no match at all for the binoscope, which brought out details in faint objects which you could only dream of in the monocular telescopes. This was confirmed by all present (about 20 people - all experienced observers). I've also had the opportunity to compare the 18" bino to a 27" mono and this turned out to be a clash between more or less equals in terms of light gathering power and the perception of detail. Elaborating on this experience would be inappropriate, however, because there were no neutral observers present. I’d also like to add some notes about a very intensive comparison I made on various objects, observing with both and with only one eye. These observations were done by me, with my eyes and with my sky conditions. I do not wish to generalise these results in any way but suppose that they give an indication of what one might expect. Overall, a nice way of putting it is that with binocular vision I can easily see with direct vision what I can only perceive with averted vision in mono. Closing one eye, not only a nebulous object becomes fainter and loses detail, but several faint stars disappear as well or become hard to see. · NGC246 (104x with OIII filters): In mono the nebula shows an opening towards the south-east. With both eyes, the nebula not only becomes significantly brighter, but the opening fills with nebulosity, making the overall aspect of the nebula decisively round. · NGC7009 (285x without filters): In mono the ansae are faintly visible. In bino they become evident and even show hint of detail. The internal structures of the nebula look much more pronounced and the overall blue-greenish hue becomes striking. A noteworthy difference. · NGC604 (285x without filters): In mono there were maybe three or four stars within the nebula that could be identified with absolute certainty. In bino an entire cluster appeared. · NGC1491 (104x with OIII filters): The difference was not that large, in a sense that what was there in bino was also there in mono, albeit fainter and with averted vision. · M76 (285x without filters): Here’s an interesting observation. In bino I noticed a tiny little star in the northern arch of the eastern wing, next to the more obvious mag. 14 star. It was there and easily visible, also with direct vision. When I closed one eye it simply disappeared. Well, I still thought I saw it but am pretty sure that this was an illusion because I had just seen it with both eyes open. After taking some time with one eye closed, looking around and then trying to spot it again, I couldn’t see it. Also the mag. 14 star was quite difficult with one eye, by the way. Over time I've grown to the conviction that detection with a binoscope increases by a factor nearing 2, or an aperture increase of 41%. Hence an 18" bino would have the light gathering power of a 25" mono. It's difficult to put a real number on it because the binoscope offers vastly enhanced contrast, whereas the bigger monocular scope offers better resolution (but suffers more from bad seeing). It may even be possible that this factor increases somewhat beyond a factor of 2 because, when observing at the limit as we astronomers do, it is far less likely that a "false" light signal is accepted as "true" by both eyes simultaneously. This figure should not be taken as an absolute. I’m not a scientist, nor do I wish to present my findings as a general guideline. It’s just an impression after years of experience with making direct comparisons and hearing comments from people who’ve actually observed with binoscopes. It may be that a binoscope brings objects with an extremely low surface brightness within reach, which remain impossible with any telescope, not even a 30”. An 18” binoscope offers the theoretical light gathering power of a 25” mono but with the exit pupil of an 18”. This means that with an 18” binoscope you can go as low as 65x and still retain a 7mm exit pupil. With a 30” scope, you’re limited at 108x. Therefore it may be possible that very large and extremely faint objects are visible in the 18” bino and not even in a 30”! With my bino I’ve observed planetary nebula Purgathofer-Weinberger 1, under an SQM 20.9 sky. I’m not sure whether this would be possible with monocular telescopes… It’s probably an interesting point for discussion. But if all of this is true, why aren't there more big binoscopes around? Why is there only one manufacturer left (for as far as I know and apart from a few home-builders) that offers them commercially? The answer's very simple: it's not about cost as such because, even though the expense for a quality bino's significant, my binoscope cost me less than a 25" Obsession. The real problem is that a big binoscope's awefully difficult to make. Alignment needs to be precise up to a nanometer and stability needs to be such that both tubes remain absolutely motionless regards to one another, no matter how you move the scope. Every single binoscope is a new adventure in which you're never sure which problems may arise. Even with all of his experience, Mr. Otte spent 15 months building mine whereas he had stated 3-4 months initially. 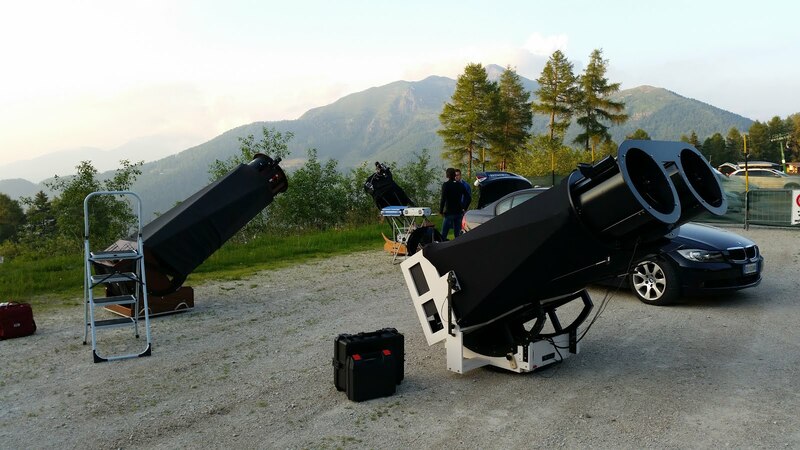 Furthermore, big binoscopes are incredibly bulky (mine's 145cm wide and weighs in at about 150kg) and are impossible to assemble by yourself, whereas you can easily assemble a 25" Dob on your own. I've given up on hauling my bino to star parties because it's simply too much of a hassle. In brief, a (big) binoscope is commercially unfeasible. I have no commercial interests (actually, Mr. Otte has recently retired) and I live happily on my hilltop under the stars. Therefore I have no reason to boast the results because I couldn't care less about what other people think. These are simply my impressions and thoughts, with my scope and eyes. Hopefully they may be useful to others. Thank you for the excellent writeup, and your carefully worded disclaimers. This article makes me wonder more about the medical and perceptive differences between using the same monoscope with and without BINOVIEWERS. Although there would be a little more light loss in the instrument when used with the binoviewer, some of the physiological advantages you note in this article may still apply. Thanks! I'll read it right after my (daily/2-hour) exercise. shower and lunch! Yep, we've been around the block on this topic ad nauseam, several times, over the years. Astounding how adamant some people get when someone politely disagrees with their opinions! And, as you ~observe~ on CN, many seem obsessed regarding numbers and studies... sometimes without ever having tried the experiences themselves! Many thanks for your lovely comments, to which I can only agree. Regarding a binoviewer, as you said, they all suffer from (significant) light loss so here the confrontation would be somewhat unequal. Also my apologies if I have been a little hard in my disclaimer... obviously I value other people's opinions highly. But as you correctly interpreted, I don't care about the useless yes-no discussions that emerge all too often on topics like these and this was what I tried to express rather clumsily. What would be the binoscope equivalent to a 15" monoscope? I might try my hand at making a smaller binoscope to see how effective they are for myself. Hi, Peter... I read the entire thing... excellent! I use the JMI RB-16s, with upgraded (Fullum!) Primary Mirrors, and also upgrades on all the other optics. Using various great TeleVue eyepieces and also Night Vision eyepieces! Seems to me that most objections to the binocular advantage are strongly influenced by the hope that it doesn't help much, or at all. Nearly all of us use and enjoy monoscopes ~thank you very much - harumph!~ [Harumph is defined as an expression of dissatisfaction, disdain or unhappiness. When someone tells you do to something you don't want to do, this is an example of a situation where you might say harumph.] One then back-solves for studies/data that disclaim or downgrade the advantages of two eyes. Plain, vanilla human nature. Politicians do this all the time! >threshold detectables bino vs mono can indeed go from "not seen" to "pretty easy"
>like the inexperienced person who concludes that seeing a Total Solar Eclipse is not worth traveling... because they don't want to travel! I'm still more curious about the bino-telescope versus binoviewer. My favorite currently is a binoviewer on a 7" Mak. As I get older, my right eye struggles with focus at large exit pupils. I'm not sure how that impacts the results. And yes, if I saw a large bino-telescope at a star party, I would wait in the line. My experience using 12.5” and 18” dobs DSO binoviewing: its great at low powers /large exit pupils. Increase magnification/smaller exit pupils results in disproportionate dimming compared to monoviewing. For bright planets/ moon the dimming is an advantage. The solution is true binocular viewing, 2 eyes, 2 objectives. The article eloquently states why few take advantage of this with mirror scopes. Another point is that using two eyes helps to diminish individual eye defects such as floaters. Great article . . I've never had a chance to use a bino, but now I will be looking for an opportunity whenever I see one at a star party. Re: Mr. Bill's comment -- at 69 y.o.a., I seem to have quite a few of them, but they don't much bother me at the eyepiece. I just use the other eye! Score one for monocular! Also, the brain needs both retinas to recreate the visual field correctly. Interesting article. I can only dream about having an 18 inch scope for each eye. I do have a binoviewer I put on my C11 and it is great for planets, M42, and assorted star clusters, depending on how dark the site is. The comments I get from other observers with my setup indicate they see more depth and detail even when the image is on the dim side. I have even made some rough plans to get a couple of C11's to make a real binoscope. Then I revised it to using two C8's. Then I decided the project is just too daunting in terms of cost, time and room in my garage for all my projects and hobbies. I need a much bigger garage! It depends on what you're looking at. My experience echoes others, the larger the object the more benefit you get from your binoculars. An 8" binoscope looking at M8 with nebula filters is easily the equivalent of a 15" scope. If your favorite targets are resolution-dependent--like spiral arms or splitting doubles--binoculars don't magically add resolution to your mirrors. On the other hand, having both your eyes open and feeling relaxed, using your brain's image stacking to remove the noise from your night vision, fixing the vision problems you have in each eye, you tend to see more detail or stick around long enough for seeing to improve and get a glimpse of something you would have given up on with one eye. Thank you for that wonderful article. As a surveying instrument technician I have lots (thousands of hours) of experience comparing the vision of both of my eyes while looking at exquisitely accurate collimators. I have found that my eyes have very different vision. One will show a field of pale green tint and the other is slightly yellow. I am not color blind in either eye. Perhaps the ability to discern more color with binocular vision has something similar going on. Of course when viewing with both eyes, the brain combines the vision of both eyes into one image, combining the subtle differences between the two. I have also found that as the eyes fatigue, the image they produce become distorted. As the eyes tire what was once a straight series nestled crosshairs, becomes a squiggly one. This makes it very difficult to see if the two arcsecond space between them is even. At any rate it is an intriguing subject and one open to scientific study. Color differences sounds like cataracts....agree that the left and right visual fields contain different information and the sum is indeed greater than simply stacking two images as in AP to increase s/n ratio. Hello Mr Bill, no, I dont have cataracts, just a few floaters... Both my eyes test near the same on an eye chart. vision differs, and to some, that extends to to their own eyes. Cataracts don't always show a difference in visual acuity.....mine tested the same but had a subtle difference in color noticeable in blinking looking through binoculars. Be interesting to see difference in eyes between left and right side of road drivers. Talking to my optometrist he mentioned that there seems to be a trend in that the left eye cataract is generally worse than the right and that maybe driving exposes the left eye more because of driver side window exposure to UV. If that has merit, my guess would be that drivers in Britain and Australia would have the opposite condition. The business of the lens of the eye gradually yellowing with age is real. My Dad had his lenses replaced a few years ago one eye at a time a few weeks apart when he was in his mid eighties and really noticed how much yellower his vision was on the eye not yet operated on in the interim. I have had one eye done (the "bad" one) and can see the color saturation difference easily. The downside is that the eye that has had the lens replaced shows up floaters more because of increased clarity.....unintended consequences. Here is an interesting link. I can see all the pattern with both eyes. A couple are difficult, but they are for my wife too. Click on the test to enlareg it. Here is an even better one. I passed both.